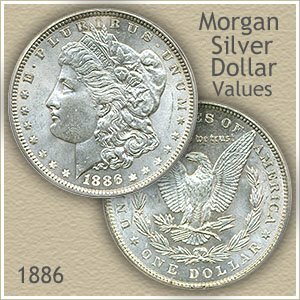 1886 Morgan silver dollar value today is $18.74 a price tied to and moving with the value of its silver content. Note: this value is updated every Monday AM. Also playing an important role in value is both, the condition of your coin and the mint that produced the coin. With a high starting value any 1886 San Francisco silver dollar is a nice find. These are identified by the "S" mintmark located on the reverse. Just below the value chart is an image showing the location to finding mintmarks. Additionally, referring to the image at the right, its "uncirculated" condition stands out as far better than most surviving silver dollars. This uncirculated 1886 New Orleans minted dollar is rare and highly valued. Absence of wear, bright luster and lack of contact marks sets this coin apart. As a collectible it is a nice example and the type collectors seek. After the value chart are sections covering mintmarks and their locations, also images and detailed descriptions helping judge condition. Using both arrives at an accurate 1886 Morgan silver dollar value, often your coin is worth more than the minimum. Scarcity and demand combine to raise the minimum value of 1886 silver dollars minted at the San Francisco mint. These are identified by the "S" mintmark found on the reverse below the eagle's tail feathers and ribbon. Also worth mention, New Orleans minted coins identified by an "O" mintmark have premium values in higher grades. 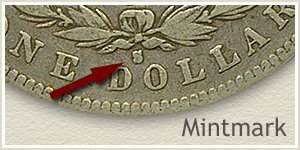 The third mint producing silver dollars in 1886 was the main mint in Philadelphia, it did not use a mintmark. Visual appeal and excitement shine from each of the 1886 silver dollars pictured. Because of their stunning eye appeal each is valued far above average coins. Also, with such diversity in appearance, many specialized collections are formed around each of these distinctly different looks. Gleaming white as first minted and mark free, the coin on the left is the first choice of many silver dollar collectors. The delicate "frosty" luster as it's referred to, is intense and complete across the entire coin. In the center, vibrant multi-color toning enhances the beauty and value of an already gem quality 1886 Morgan silver dollar. A date collection of these colorful toned coins is a rewarding challenge to collectors. The result of being one of the firsts strikes from newly polished dies, "proof like" Morgan dollars are scarce and majestic in appearance. Pictured on the right 1886 Morgan silver dollar value frequently doubles as collectors vie in pursuit of these technical wonders. An amazing group of highly collectible coins! 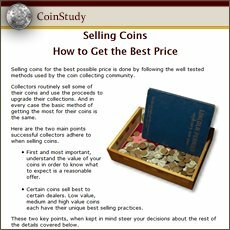 Essential to finding highest accurate coin values is determining condition. By closely examining the surface and judging the amount of wear reflect its "grade." Entries in the value chart above are listed under these grade headings. 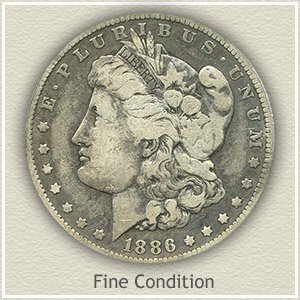 And in the case of your 1886 silver dollar, if struck at a branch mint, many subtle details have a significant role. 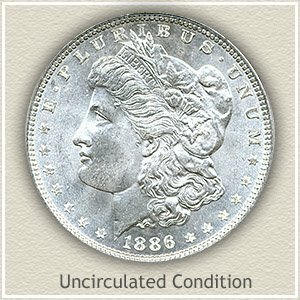 Uncirculated: Is your 1886 Morgan silver dollar value at a premium because of "uncirculated" condition? An uncirculated coin is without any wear to its surfaces. Original silver mint luster still covers all design details. Holding your coin by the edges, and by tilting and slowing rotating, unbroken bands of luster radiate from edge to edge. Any wear disrupts these bands, most evident on Liberty's cheek. Extremely Fine: Wear has started to diminish small details of the hair just behind Liberty's ear and forehead. Further behind the ear the folds of the cap are now just slightly flattened. On the revere, small amounts of wear are visible on the tops of the wings, and obvious on the neck and breast feathers. Light overall wear defines silver dollars in "extremely fine" condition. 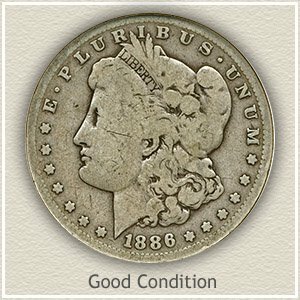 Good: An 1886 silver dollar in "good" condition is well worn with most of the metal forming the high reliefs of design removed. Liberty's cheek and forehead have blended into one connecting with her hair and cap. The rim is almost gone, however the stars and lettering remain separate of the rim. Giving your coin character, some detail remains, large curls of hair behind the neck and a full "Liberty" in her coronet. 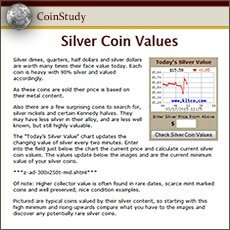 Check all your values with the silver dollar value chart, separating the common from the rare. From the early Bust and Seated Liberty Dollars to Morgan and Peace silver dollars. Rising silver prices, increasing demand from both collectors and rare coin dealers requires a second look at your old coins. It is an excellent index with images and text links to all coin series, from Cents to Gold. 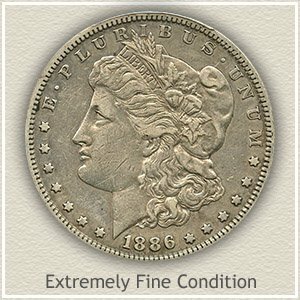 Value charts, grading images and descriptions uncovers 1886 Morgan silver dollar value also all common to rare coin values found in your box of old coins.